Let’s try a task. Take a piece of paper and very quickly, sketch out an organisational diagram for the place where you work. Think about the power relationships involved, who you and your colleagues report to, who these superiors report to in turn. This is a fairly standard organisation chart for a private language school. 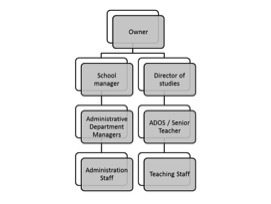 When you start looking at typical organisational structures in state primary and secondary, they are invariably a lot more complex, reflecting the additional subject areas taught and aspects of student welfare and school development; but they still share the overall shape – a hierarchical transfer of authority from top to bottom. It represents a very traditional view of authority, one in which the people at the top get paid the big bucks to take all the important decisions and in which these decisions filter down and are imposed on the staff who actually do all the work. Very often, these decisions are resented because of the additional work they represent and because the change is often presented without consultation or without a rationale. So what can we do to make things more effective? In his book “Upside Down Management”, the businessman John Timpson argues that in many cases the people at the top are so far removed from the day to day business of dealing with customers that they aren’t actually the best placed people to be making these decisions. In simple terms, his view was that the key to running is successful business is to have happy customers and to have great jobs. To do that, he argues, you need to turn the traditional hierarchies upside down. If you want happy customers, you need to give the people who deal with the customers the power and authority to make the customers happy and to keep them that way. This means you need to give your front line staff the authority to do what they need to do to achieve this goal. This represents a fundamental shift in managerial psychology and philosophy. The manager no longer makes decisions and imposes them or acts as a vehicle for decisions that are “coming down from on high”, but instead acts as a conduit in the other direction. The front line staff member outlines the ideas they want to try out to improve the business in the local context and the manager helps them to do that. The manager’s boss, in turn acts to help the manager, and so on and so on all the way up the company structure. Or rather all the way down. So how might this work in an educational context? If we take the view that our students are our customers, which is true in some situations and perhaps best seen as a metaphor in others, then it follows that the people who are best placed to keep the students happy are the teachers. It is the teachers who interact with the students on a day to day basis, the teachers who have to help the students achieve their goals. The teachers are the front line staff who are best placed to determine what the students need and want and what the most effective ways to fulfil these needs are. Teachers therefore need the freedom to be able to react and respond to these needs in whatever way they see fit and not to merely act within a predetermined syllabus or the constraints of the coursebook. They need to be helped to do this by pursuing personalised professional development goals that are tailored to their specific needs. How can I help you to do your job better on a day to day basis? What resources do you need to help your students more effectively? What training or development would YOU like to pursue? This might sound like a blindingly obvious thing to say and there are probably many educational managers out there who are thinking “But I do this already”, but it is a LOT more difficult than it sounds. Listening is 50% of communication and is a much more difficult skill than it appears. An awful lot of the time, what we listen to goes unheard because we are too busy thinking of what we want to say next or because we have dived off down a tangential thought. The trick is to listen with nothing on your mind.